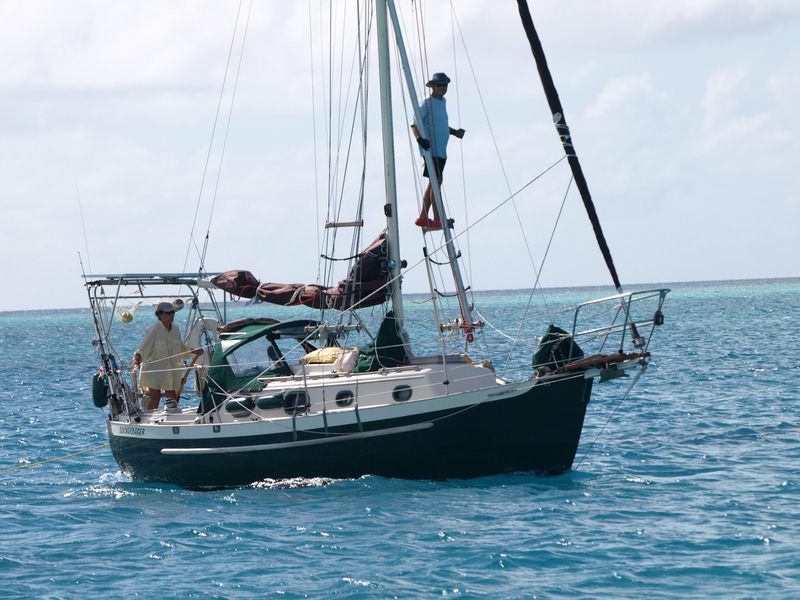 Karen and Jim's Excellent Adventure: Sockdolager, our Dana 24, is for sale. Update: Sockdolager has been sold. 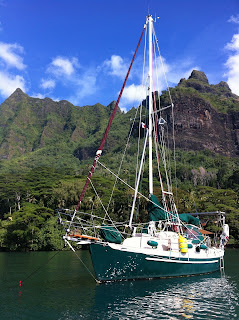 After many miles in the Pacific Northwest and an excellent adventure from Port Townsend to New Zealand in which our dear little Sockdolager has carried us safely more than 12,000 miles, we find that we are no longer sailing her enough. So, we are putting her up for sale. As you can see from the photos, she’s compact but capable. 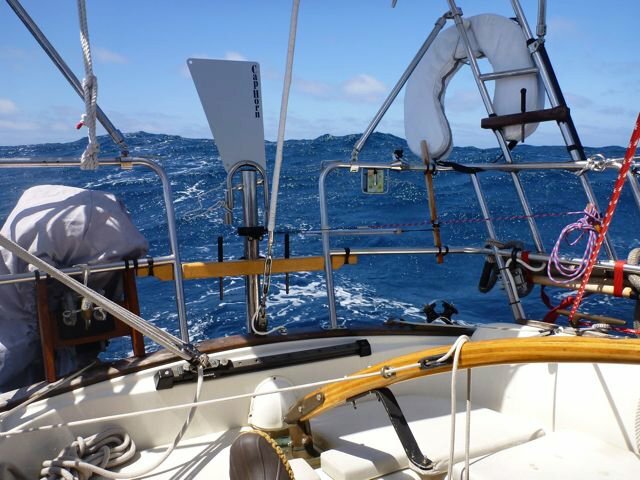 Sockdolager is a little champion who’s meant to be sailed. 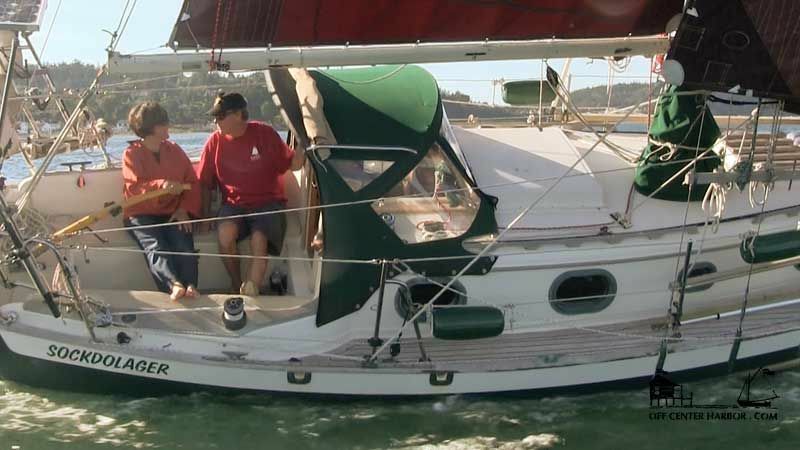 With her shoal draft of 3’10” you can get into spots many larger cruising boats can’t. Here she is in a lagoon all to herself, at Aitutaki atoll in the South Pacific. 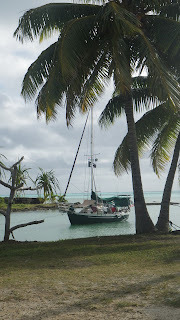 Our own private lagoon in Aitutaki atoll, Cook Islands. We’ve been spiffing her up and she looks better than ever. She’s loaded with equipment; we’ve made a lot of custom improvements as the photos will show (see also Fiddly Bits). Her sails, standing and running rigging are strong, she’s documented for foreign travel, and she’s ready for a new Excellent Adventure. 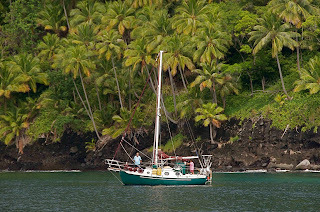 Sockdolager arriving at Fatu Hiva, Marquesas after her Pacific crossing. Yes, K&J are looking stunned at all the greenery. Always a fun view. The 175-watt solar panel eliminates the need for a power cord or running the engine to charge batteries on all but the cloudiest days. Sail plan. Sockdolager is cutter-rigged with a removable inner forestay. Sockdolager's interior. 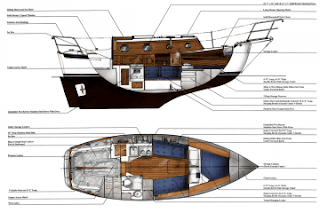 For those Doctor Who fans among you, the Tardis may come to mind when you see the 6'1" headroom and gasp, "This CAN'T POSSIBLY be a 24-foot boat!" A custom hatch gives access to a LOT of stowage under the cabin sole. Poled-out drifter keeps her moving in light air. 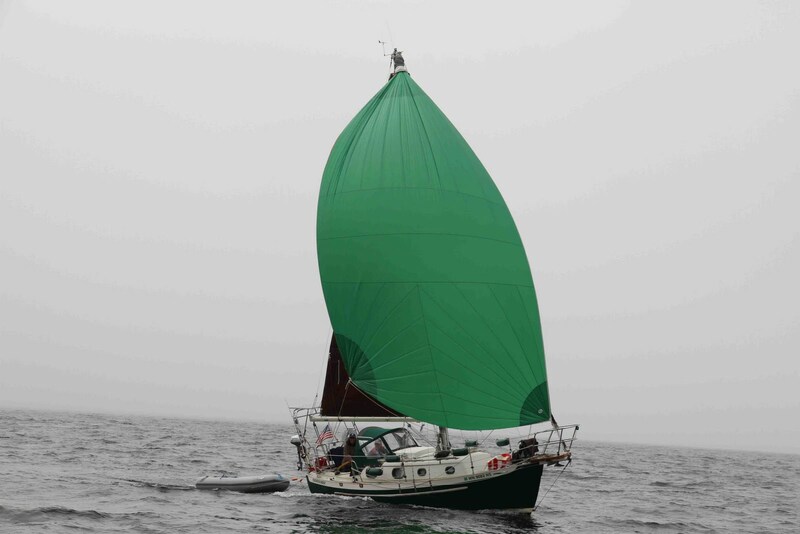 Here's the spinnaker; this is an older photo before we added the stainless arch and solar panel. 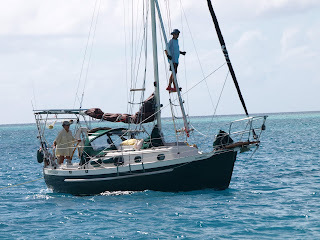 Storm sail inventory: Backstaysail, Storm Trysail, Storm Staysail. Handy water bottle pocket. Roped dodger edge funnels drips away from cockpit and prevents chafe. Rollup awning for underway. 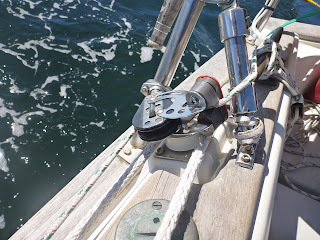 Note low outboard motor mount to prevent interference with self-steering wind vane. Canvas storage pockets in head. You can never have enough of these. 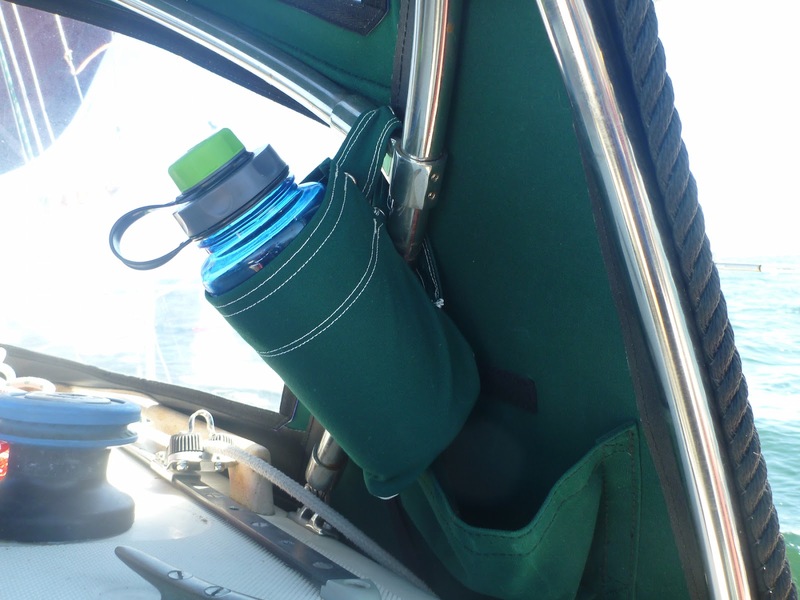 Canvas pockets and thermos storage at companionway. Sockdolager is a cutter rig with a removable inner forestay. Her standing rigging, including chainplates, was completely replaced in 2009-2010. Most of her running rigging is new. • 2 spinnaker halyards (port & starboard). Ratlines for climbing. 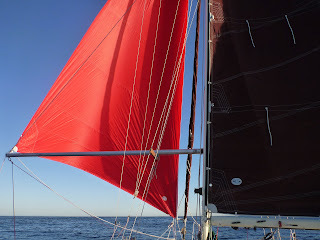 Radar does not interfere with staysail or genoa. Furling arrangement for roller-reefing genoa. 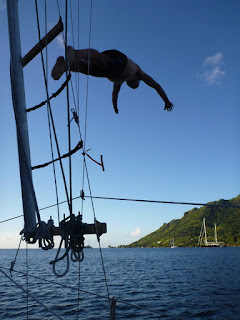 This allowed far less effort in furling in heavy wind. An excellent use for ratlines. Engine access from main cabin. This photo shows the forward end of the removable cockpit sole, and custom companionway hatches. The bar across the front of the dodger houses the radar mount. Odyssey batteries are strapped down. Single-level engine control saves space and confusion. 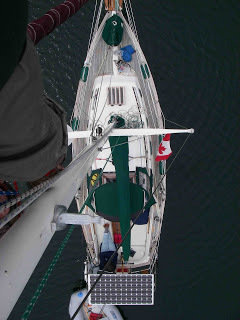 View from starboard quarter, Cape Horn wind vane with custom platform visible. Instrument panel, VHF radio & GPS above. Custom fold-down box for laptop that connects to Ham/SSB radio above it for email, weather faxes & GRIB files at sea. 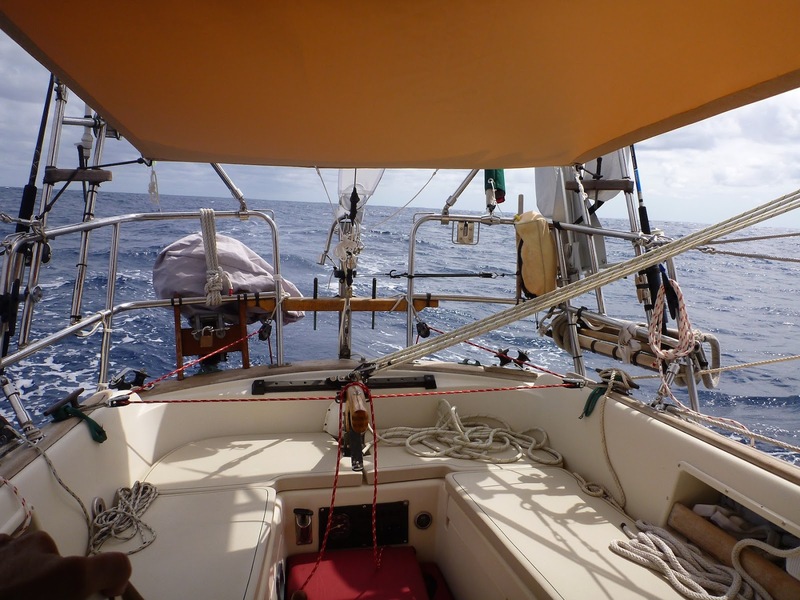 • 10 feet of chain, 250 feet 1/2 nylon 3 strand rope rode in stern locker abaft rudder post. Custom galley seat for the cook when guests fill the cabin. Head. Custom shelving in locker behind head. • All new foam and professionally made upholstery cushions in 2011. • HyperVent under V-berth cushions to prevent condensation. • Hanging locker converted to three large drawers for clothing and pots/pans, with “secret” compartment stowage beneath and above. • Custom shelving in locker behind head. Hanging locker conversion. Vertical chart storage either side of drawers; hidden compartments above & below drawers. Storage area atop hanging locker is captured with this removable custom arrangement. Custom companionway steps utilize wasted space, capture hatch in sole, and provide seats for galley and companionway. Top step lifts to make checking engine oil easy. Handy companionway seat for wet night watches or a mini-table for serving snacks to hungry guests. Loads of storage in main salon, including behind and underneath settees. Second laptop storage area in pull-down basket for nerds who sail. • All teak trim has been recently sanded and is ready for new owner's choice of finish. 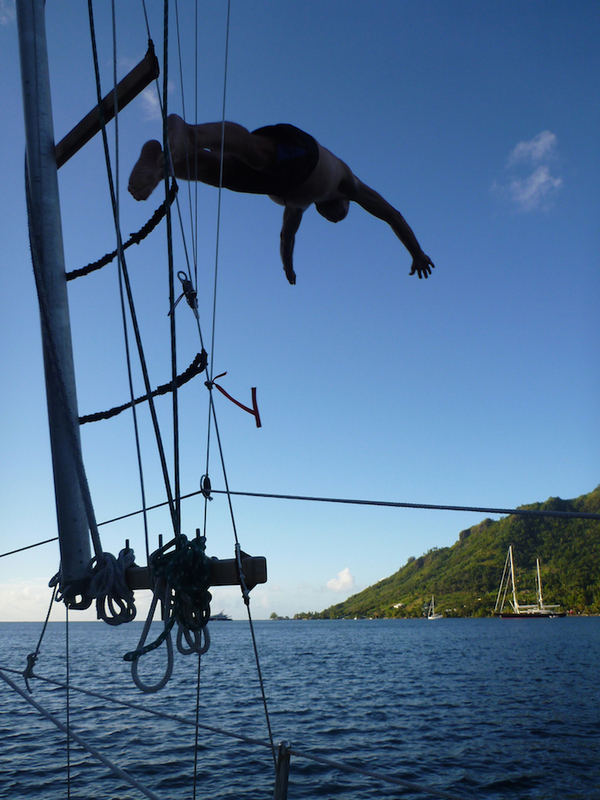 • Sockdolager has teak decks, which we liked for the good footing. Bung maintenance is up to date. Offshore in rough weather, 2011, the wind vane handling all steering. 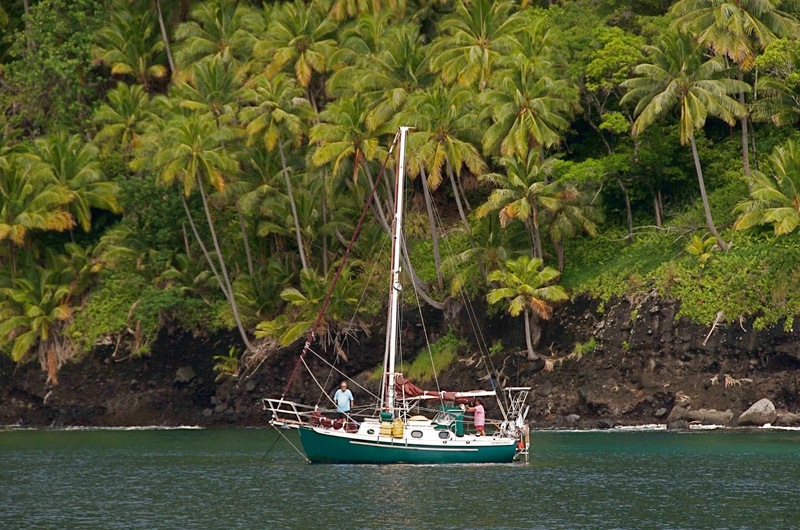 • Large selection of engine, head, rigging, and other spare parts including spare tiller. • Coming soon: link to 3 videos of her in summer 2013 by Off Center Harbor. • Review of a customized Dana that crossed the Atlantic and is now in Europe. • Spectacular kite cam compilation, also from Chris. We wonder, where will her next excellent adventure be to? Kind of nostalgic here, but to everything there is a season. I've been following along your journey for at least 6 years while I slowly rebuild my Bristol 27. I'm sad to see you all have to part ways with Sockdolager, but I agree that there is a season for everything. Best of luck and joy. Thanks, Andrew. It is kind of sad to part with her, but also exciting to see where her next adventures will lead. And ours, too! Aww so sad... Best wishes for your next excellent adventures! Hope your Dana adventures continue to be wonderful, Richard. Wait, as you know, while sailing over the next horizon you can expect the unknown and unexpected right? Well how about this: A blast from the past is now looking for crew! Wanna get away for a bit? Come sail along with me on my Venus Ketch. Guess who? BTW: I've been with you guys ever since Smugglers Cove on Santa Cruz Island. Thanks! Hope you are well and happy. The Channel Islands were one of the highlights of our cruise. They were just so unexpectedly wild and beautiful. But our eyes are turned north with the unending novelty of these two words used together: winter. cruising.